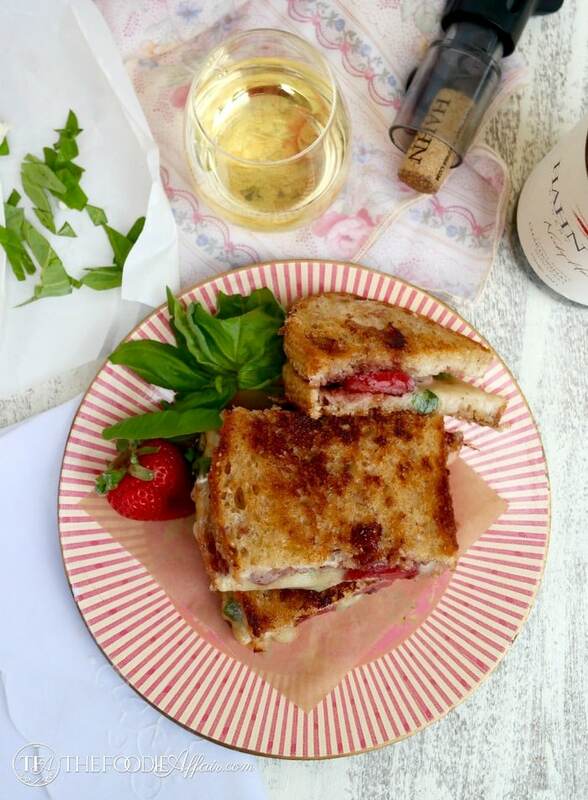 This sandwich is a flavorful combination of sweet strawberries roasted in balsamic vinegar with melted creamy brie cheese, and a punch of pungent and peppery tasting basil leaves. 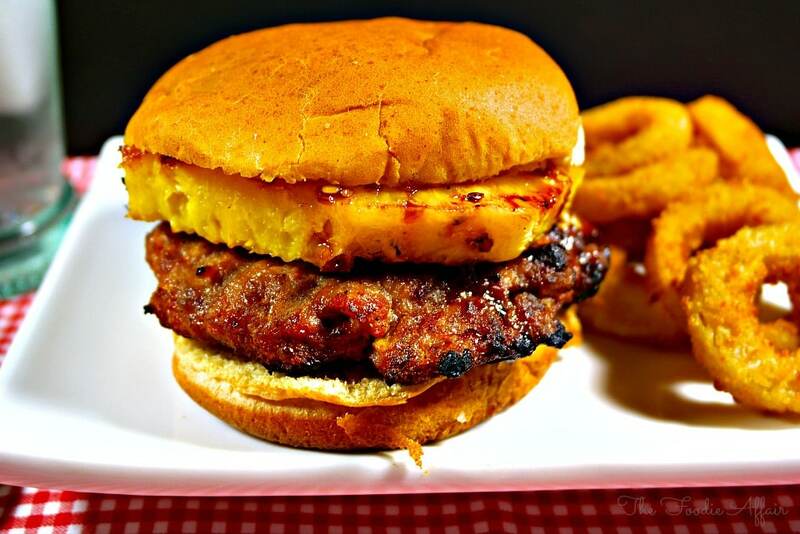 This is not your ordinary sandwich! 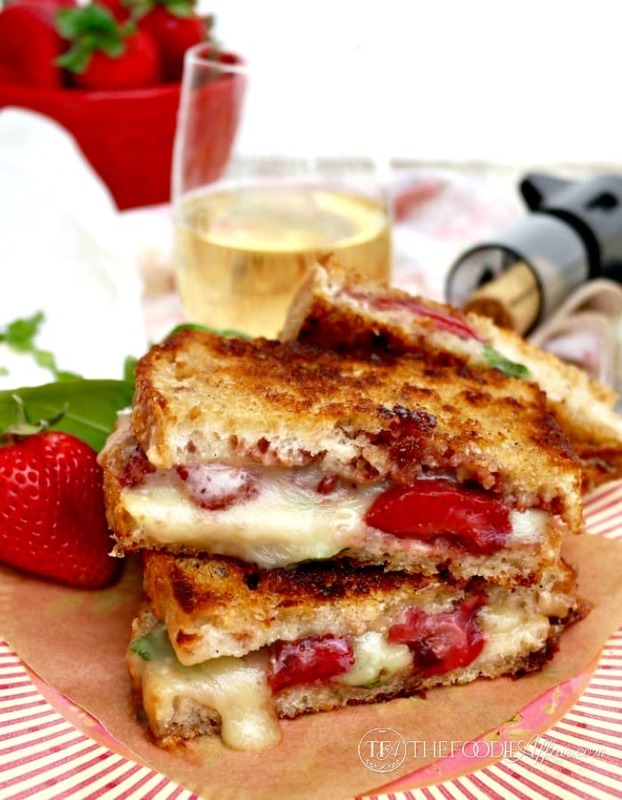 This Strawberry Balsamic Brie Grilled Cheese sammie belongs in a bistro that serves delicious tasting ingredients that aren’t so common, but why hunt down a restaurant when you can make this at home for a fraction of what it might cost going out! Plus, you can enjoy a glass of wine or some chilled bubbly with your feet propped up! Your tastebuds will be dancing with joy! Remember that Balsamic Roasted Strawberry recipe I shared with you last week? Well, it has made a couple of more appearances on my table. It’s so darn good, easy to make, and hello, strawberries! Yeah, those delicious ruby red berries have been favored! To be honest, sandwiches aren’t my go-to type of food to eat unless it’s heated like a patty melt is or saucy like a turkey meatball sub. I guess it’s warmth of the meal that I prefer or the gooey cheese that this sandwich is filled with! 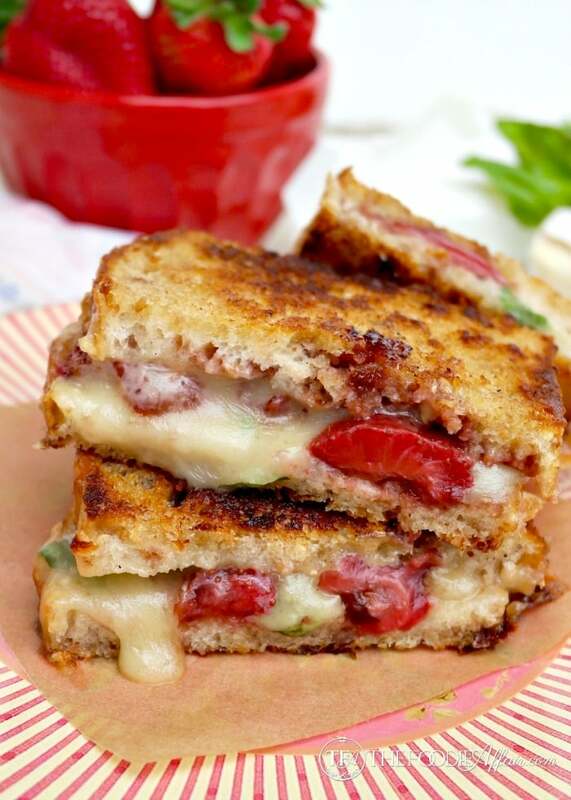 Did you hear that April is National Grilled Cheese Month?! Someone decided we should celebrate all month long, so I needed to make sure that I have something to celebrate with! This sandwich is a pretty meal to serve and enjoy with friends or you can open face it on little baguette slices and dish up as an appetizer! 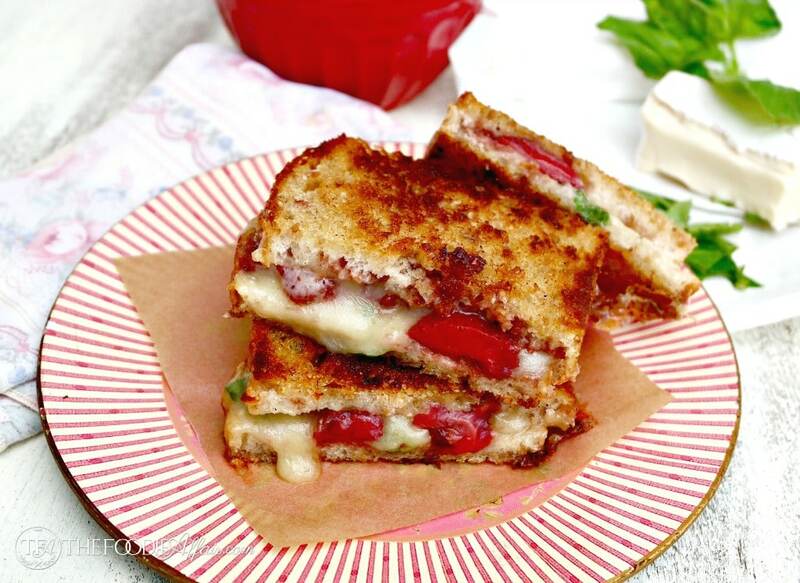 When was the last time you ate a grilled cheese sandwich? 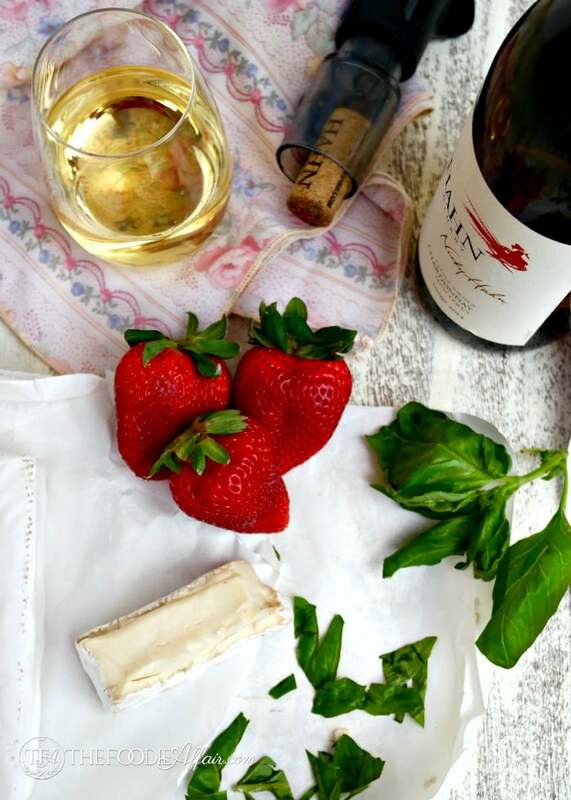 Sweet strawberries roasted in balsamic vinegar with melted creamy brie cheese, and a punch of pungent and peppery tasting basil leaves. This makes a delicious lunch for a special occasion. Warn skillet on medium heat. Butter outside of bread and place on bread slices. On one side layer 3-4 slices of cheese. Top with 2 tablespoons of balsamic strawberry sauce and a tablespoon of basil. Top with the other slice of buttered bread.Cook on each side for about 3 minutes or until golden brown and cheese melts. Repeat with second sandwich. Slice and enjoy! Wow this looks so delicious! I love Brie with Strawberries. This is perfect! Thanks! The flavors together really work well. That looks sooooo good, unfortunately I would not be able to enjoy it. Staying off all cheese for now, may be allergic to rennet. Oh, no Norma! Yes, figure out what you are allergic to, but I hope you can bring cheese back into your diet! Yum! I’ve never considered putting strawberries on a sandwich, but it totally makes sense considering that’s what jams are made of. It sounds delicious with the brie and balsamic. This sandwich is definitely a special one. Different and tasty! That looks so good. What a unique way to eat grilled cheese. Wow! This looks like an amazing take on the traditional grilled cheese. It will be on my list for possible date night dishes as we try to do those mostly at home to save money. Yes, turn this sandwich into an evening to remember, Laura! Never heard of roasting strawberries before–hum—I actually had a grilled cheese sandwich when I was eating lunch out a couple of weeks ago. I don’t know why I don’t think to make one at home–they are really easy and delicious. This looks amazing and I am all for that sweet/savory combination of flavors. What a delicious sandwich! Thanks, Renee! I love it when a simple sandwich gets a delicious makeover! That looks incredible and I pinned it. It’s strawberry season here, so I’ll be making this! I love brie! And this sandwich looks amazing. I agree, I much prefer a warm sandwich over a cold one. Warm sammies feels hearty to me! Worth the prep effot! I never thought about putting strawberries on a sandwich. But that looks so yummy! Load up on those berry beauties! What a great grilled cheese! This combo make my taste buds want to do a happy dance. Yum! I’m dancing right next to you, Kristin! This looks SINFULLY delicious!! Yum! I wish I could try this, because I am so intrigued! It’s a lovely combination, GiGi! I hope you taste for yourself! Oh my goodness I just want to do a face plant in your dish! This looks so good and a little sweet and a little bit savoury. Love that! Oh my sweet goodness! These look amazing!! Oh, yes, I know what you mean. Gotta go easy on the brie, but when you do indulge, make it a memorable experience! These look absolutely amazing! I will need to make this for sure! Thanks, Caitlin! You do need to enjoy this sandwich soon! Yum! This looks fantastic! Your photos make me want to go on a picnic right now. 🙂 thanks, Mary! Grab a blanket and go!